Druids angry at the vandalism of a sacred site are offering a reward in an attempt to find the culprits. The pagan community is furious that vandals daubed more than 70 of the Rollright Stones on the Oxfordshire/Warwickshire border with yellow gloss paint. 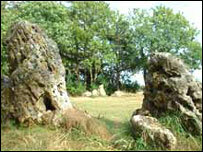 Estimates for cleaning up the Neolithic circle, are now put at between £30,000 and £100,000. The Pagan Federation is to offer £1,000 to help police find the vandals. Karin Attwood, spokeswoman for the federation, said that the pagan community was doing everything in its powers to find those responsible. Mrs Attwood, who is also a member of the trust overseeing the ancient site, told BBC News Online: "I know that the whole of the pagan community is reeling from this one. "It's comparable to someone doing something like this to Canterbury Cathedral or the Wailing Wall. "It is regarded as a very important place for pagans." 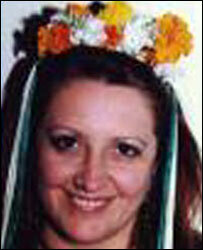 Mrs Atwood said the attack, which was discovered on Thursday, 1 April, had been the talk of pagan websites. "If the power of magic and the power of prayer works the people who have done this should start to feel very uncomfortable," she said. The circle has been used for wedding and baby-naming ceremonies and other celebrations. The circle, which could date back to as early as 2500 BC, boasts important examples of lichen said to date to about 1100. Conservation experts from English Heritage, who helped restore stones at Avebury, were brought in to assess the damage. Site manager Dohn Prout told BBC News Online that it could take up to 25 weeks for the restoration to be carried out. He said there was the possibility that the price of admission to the site might have to be increased to raise funds for the work. He said: "It will be a serious amount of money. Who's going to pay for it, I don't have a clue."